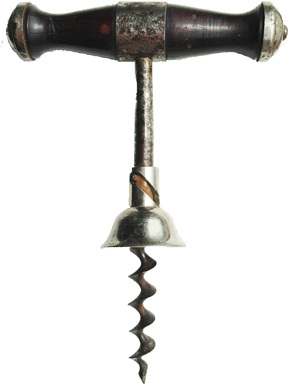 On April 22, 1884, Thomas Curley of Troy, NY was awarded patent # 297,232 for his corkscrew. 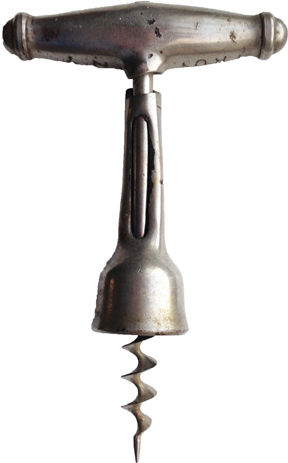 My invention relates to improvements in corkscrews; and consists in providing the screw-shank with a cup loosely fitting to revolve thereon, the movements of the cup being controlled by a pin projecting from said shank into slots in the cup. The object of my invention is to provide for easily and quickly disengaging a cork from the corkscrew after it has been drawn from the bottle. While Curleys often show up that closely match the patent drawings, there are several variations. Wooden handles with end caps, wooden handles without end caps, cast iron handles, steel handles, and the desirable (not that they all aren't) integrated cast handle, these all carry either Curley's name, Troy, NY or the patent date of April 22, 1884 or a combination of these--with the exception of the cast iron handle which has the incorrect patent date! 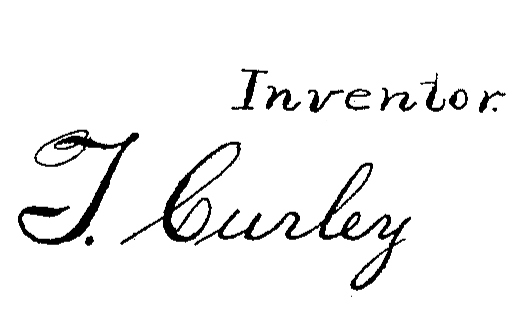 There are also those that are marked Empire, so marked for Empire Portable Forge Company, as they surely were manufacturing the Curley as well--and most likely given the incorrect date in the advertisement shown below, they were responsible for the wrong date that appears on the cast handled corkscrew Curley. What is remarkable to me, is the similarities between the Curley with the wooden handle and the Hicks & Reynolds with the wooden handle. Given they are both corkscrews from Troy, NY and made (presumably) in the same time period, there has to be a story. Were they friends, drinking buddies, enemies, competitors? Thomas Strait, also of Troy, NY, whose patent dates to 1883, in his obituary lists that he was a member of "The Corkscrew Club." Were Curley, and Hicks and Reynolds also members? I am sure that at some point, I will find myself in Troy, New York hunting down information in the public libary--and other places--with hope of unearthing some more information about the corkstrew boys from Troy. 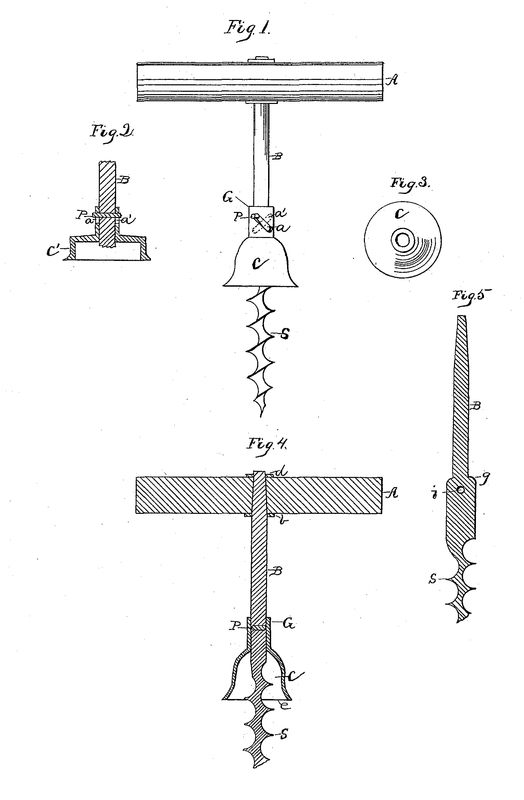 The corkscrews pictured below, are corkscrews from Thomas Curley and a couple from Hicks and Reynolds. 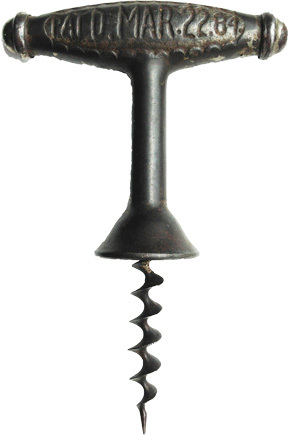 If you have a corkscrew that looks similar, please drop me a line! marked "T. CURLEY PAT'D" and "TROY NY"
Marked, "T CURLEY TROY, NY" with the incorrect patent date "PAT'D MAR. 22, 1884"
Wooden handle Curley with cast iron bell. Marked "APR. 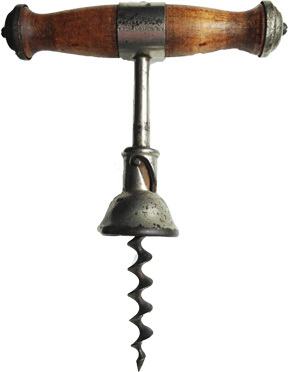 22, 1884 T. CURLEY TROY, N.Y."
Dark Wooden handle Curley with tin bell. Folding Mumford - this one is really interesting, as it has all the marking that would indicate it is a Mumford, yet looks identical to the Piper patent of TK.